"Truly amazing!! We will never forget that. Thank you for making our day!" why choose rooster as your wedding magician? Why not give your guests the ULTIMATE WEDDING EXPERIENCE!! You can now have the confidence to truly relax and enjoy your special day! The knowledge that Magician Rooster will be leaving your guests with amazing and unforgettable memories, is the best way to make your big day run as stress free as possible. Rooster is known as one of the UK leading wedding magicians. A seasoned and experienced performer with performances up and down the UK, as well as over seas, Rooster has had the privilege of sharing his magic with many happy couples and their guests on their special day. Having Close-Up Wedding Magician Rooster at your wedding is the perfect way to break the ice and keep your guests entertained. This is your big day, and attention to detail is everything! Not sure where to book Wedding Magician Rooster within your big day? Not a problem! There are specific points within a wedding where Rooster's Close-Up Magic would be perfect! Have a look below to see how Wedding Magician Rooster would best would suit you. The perfect start to your big day! Rooster's Close-Up Magic is the perfect ice-breaker. It will allow conversation to flow freely among your guests, creating the perfect atmosphere to get your day off to a great start! Slick, calm and professional, Rooster is able to mingle from table to table, creating moments of amazement, applause and laughter, leaving your guests in the mood for the rest of the days events! Notoriously the point within the day when guests, who may not be familiar with each other, meet and chat freely for the first time. Alcohol starts to flow, and what better way to keep your guests entertained than with some strolling magic! 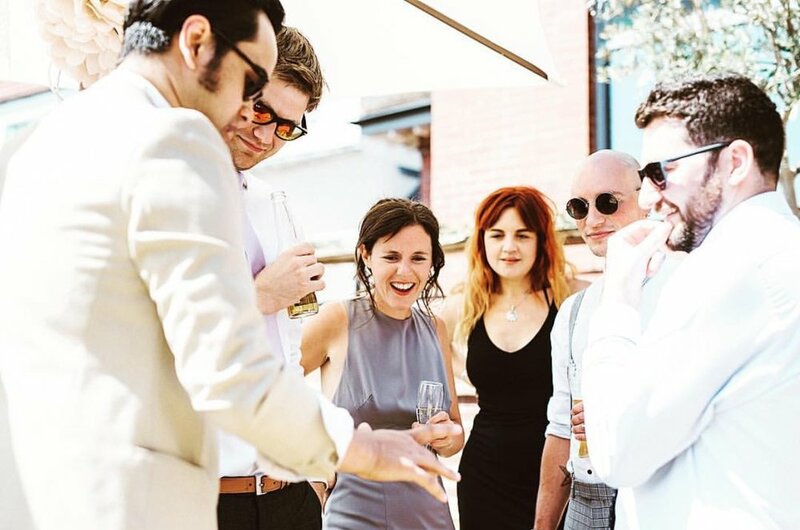 Wedding Magician Rooster can mingle expertly throughout your guests performing amazing mind blowing magic, keeping them thoroughly entertained so that you can focus on your wedding photographs and the rest of your day. How better to keep things going than adding Close-Up Magic to your evenings proceedings! Guests that may have not been able to be there from the start of the day start to arrive, and what better way to keep them entertained than with Wedding Magician Rooster! Extremely visual and family friendly, Rooster's Close-Up Magic will see your evenings events out with a real bang! "You were the perfect choice! We couldn't have asked for a better magician at our drinks reception. Rooster was professional, polite and the magic was the best we'd seen! Thank you!
" We booked Rooster for our wedding and all i can say is that he is worth every penny and more! All of our guests commented on how amazing he was and it was definitely one of my favourite parts of a very special day! "